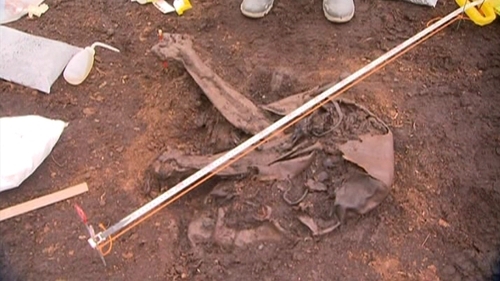 Archaeologists believe a body uncovered in a Midlands bog could be up to 3,000 years old. Staff from the National Museum as well as Bord na Móna workers have spent the day working on the human remains, which were found partially buried in a leather bag in a bog just outside Portlaoise. Ned Kelly, the head of antiquities at the National Museum, said it is possible the person could have been the victim of human sacrifice. The body's legs, which were not enclosed in the leather, have been preserved by the chemicals in the peat. However it appears that the torso and head, which were in the bag, did not survive. The body is the latest in a number of discoveries made in the same bog over the last number of years which includes bog butter, leather shoes and axe heads. The remains will be removed from the site shortly and taken to the National Museum for analysis and preservation. Radio carbon dating will be carried out on a sample taken from the body to determine the age of the person while it is also hoped the skeletal remains will show if the person was male or female. The remains were found by a Bord na Móna worker late yesterday evening just seconds before the machine he was driving was due to pass over - and probably destroy - them.